In retrospect, it was probably inevitable. Bookselling behemoth Barnes & Noble has spent much of the past decade and a half duking it out with online archrival Amazon.com. So when Amazon unveiled its Kindle e-reader two years ago, it pretty much demanded some sort of response from the 136-year-old merchant. That response is the Barnes & Noble Nook, and its arrival this week signals the start of a digital transition for the bookselling wars. The Nook has much in common with the Kindle, from its playful name to the paper-esque E-Ink display to built-in 3G wireless that lets you start reading a book seconds after you’ve decided to buy it. Even the prices–$259 for the device itself, and $9.99 for most bestsellers–are identical. For all their similarities, the Nook packs more pizzazz than Amazon’s e-reader, in the form of the color touchscreen it uses for much of its navigation. It aims to be more open, letting you read tomes you buy on PCs, Macs, iPhones, and BlackBerries–and even on e-readers from companies other than Barnes & Noble. And it brings back a virtue of dead-tree books that people have taken for granted for centuries: the ability to loan them to pals. For this review, I got to spend some quality time with a Nook, running the software version which will be installed on the first Nooks to reach customers. As I was finishing up my review, B&N was racing to ready itself for the Nook’s debut this week–a few features weren’t yet up and running, or had rough edges that may be eliminated by the time the first consumers turn on their Nooks for the first time. 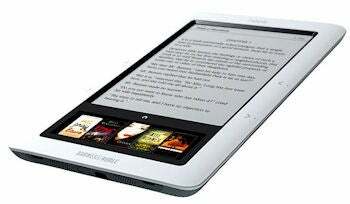 Let’s get one thing out of the way right now: The Nook isn’t a Kindle killer–not in this initial form, at least. For all its pleasing touches, intriguing innovations, and clear advantages over the Kindle, it feels like a less-than-perfectly-polished 1.0 product, just like Amazon’s first e-reader did a couple of years ago. The user interface is surprisingly sluggish, there are some usability gaffes, and I encountered a major bug with the device’s most-touted feature. Even the much-hyped lending feature has a major gotcha: You can lend a book once. Period. The good news is that these issues all relate to software, not the physical design. Barnes & Noble plans to quickly use the Nook’s auto-updating capability to push out fixes and refinements; given that the device is sold out until early 2010, it’s possible that the Nook that most purchasers get their hands on will be a meaningful improvement on the one I tried. And a slightly more zippy, less quirky Nook could indeed leave the Kindle in a clear second place. Even an imperfect Nook is easily the Kindle’s most serious rival, and by far the most important e-reader to arrive since the first Kindle. Amazon’s e-reader may be a fixture at the top of Amazon’s home page–making its current status as the merchant’s best-selling item pretty much a self-fulfilling prophecy–but it has no brick-and-mortar presence whatsoever. Sony’s Readers are widely available at retail, but in a relatively subdued fashion; Barnes & Nobles’s other bookmongering nemesis, Borders, sells Sony’s e-readers, but sticks them in unmanned, easy-to-ignore kiosks. All of which gives B&N the opportunity to introduce millions of American book lovers to the still-nascent notion of digital books. 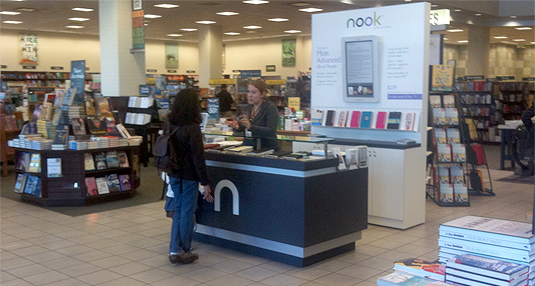 A Barnes & Noble representative told that the company intends to turn its thousands of store employees into passionate Nook advocates. If I sold books for a living, I’m not sure if I’d see the Nook as an opportunity for evangelism or as a threat to my livelihood. But in an era that’s seen so many venerable retailers of content go belly-up, it’s impressive to see Barnes & Noble embrace technological change with such gusto.